Demonstrators on a march in September to protest against spending cuts and tax rises. The Spanish economy is sliding deeper into recession. Spain fell deeper into recession in the third quarter, upping the pressure on Prime Minister Mariano Rajoy as he seeks more austerity measures and considers requesting a eurozone-led bailout. Preliminary central bank figures for the quarter released Tuesday showed the Spanish economy shrank by 0.4% compared to the March-June period, with contractions occurring in both government and household spending. Year-over-year, the economy contracted by 1.7% in the three months ended Sept. 30, compared with 1.3% in the second quarter. Spain, the eurozone's fourth largest economy, is stuck in its second recession in three years. Both the government and the International Monetary Fund are predicting further contraction next year, although they differ on the scale. 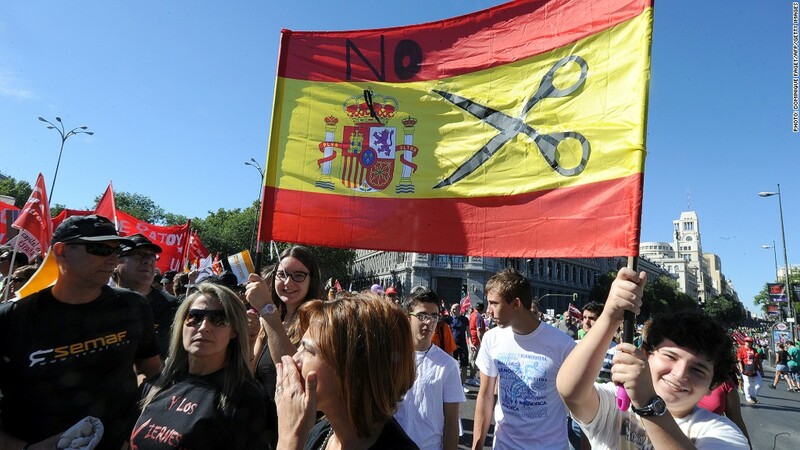 Unemployment has risen to record levels around 25%, putting Spain on a par with Greece, and sparking angry protests at the waves of spending cuts and tax increases introduced by the government to reduce debt. Rajoy presents his 2013 budget to parliament later Tuesday. It includes plans for further austerity measures aimed at bringing down the budget deficit. Opposition groups have promised to organize more protests in response. Yields on Spanish government 10-year bonds soared above 7% in July on fears the government would default. But they fell to just above 5% as Madrid won a promise of eurozone help for its banks and the European Central Bank pledged to buy government bonds. Investors have begun to demand a higher risk premium -- the 10-year bond was quoted at 5.6% Tuesday -- due to a lack of clarity about when Spain will formally request help from the European Stability Mechanism, one of the conditions for ECB action. Rajoy's People's Party won an election in his home region of Galicia last weekend. Some analysts had expected a bailout request to follow, but last week's lack of progress at an EU leaders' summit on the mechanics of the ESM could lead to further delay. The ESM is the eurozone's permanent rescue mechanism, replacing the European Financial Stability Facility (EFSF). "Uncertainties remain around, for example... whether the EFSF loan to recapitalize Spanish banks will remain on Spain's sovereign balance sheet and how soon these issues will be resolved," ratings agency Fitch said in a note. Ratings agency Moody's last week confirmed its investment grade rating on Spain, based on the assumption that Madrid will tap the ESM, and reflecting progress on fiscal and banking reform. But it cut its rating Tuesday on five Spanish regions -- Andalucia, Extremadura, Castilla-La Mancha, Catalunya, and Murcia. Moody's attributed the cuts to deterioration in liquidity, large debt redemptions due before the end of the year and increased reliance on central government funding that masks fundamental economic weakness. In another reminder of southern Europe's financial woes, Russia said Tuesday it was still discussing a €5 billion bailout loan for Cyprus. "We are working through this question, but until now there have been no (new) developments," Finance Minister Anton Siluanov told reporters. The Mediterranean island state is the fifth of 17 eurozone countries seeking financial support. It is heavily exposed to losses on Greek loans.